During the Week of I Advent, Mr. Jason Boggs of Boggs Auto Collision Rebuilders of Woodbury contacted Fr. Burgess to advise him that Miss Mariani Torres, the 20 year old daughter of our parish sexton, Mrs. Mariana Torres, is the recipient of a completely reconditioned 2008 Chevrolet Equinox. 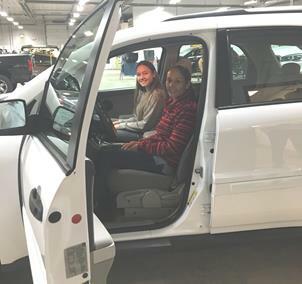 The priority of their Benevolence program, Boggs Auto has provided a deserving family, individual, or not for profit organization a completely refurbished car at no charge with an entire year’s worth of auto insurance to go along with the vehicle as part of their gift. Mariani graduated with honors from Woodbury Junior-Senior High School in 2016 where she participated in many extracurricular activities to include being a Varsity cheerleader and a member of the drama troupe. Upon graduation, Mariani continued her studies at Rowan College at Gloucester County (RCGC) as a State of New Jersey STARS scholar. NJ STARS is a scholarship program exclusively for New Jersey residents that covers the cost of tuition at New Jersey’s 19 community colleges. Currently a Sophomore with a most impressive GPA, Mariani works part-time for Heritage’s Dairy Stores and plans on continuing her education at Rowan University beginning the fall of 2018 as a psychology major. The surprise presentation was made on Tuesday, December 19th at 10:00 AM with family, friends, and teachers gathered for the well deserved expression of congratulations. For fourteen years, Boggs Auto Collision Rebuilders has given one deserving individual another reason to be grateful each year around the holiday season. This year that deserving individual is Mariani Torres. Mon-Fri: 8:30 a.m. – 4 p.m.
Sun: 8 a.m. & 10 a.m.